Lacquer arts is an important Asian cultural heritage The purpose of the Asian Lacquer Craft Exchange Project is to promote natural lacquer arts, crafts, industry, and education throughout Asia. We do this by bringing artists, artisans, educators, and scientists together for seminars, workshops, and art exhibitions. 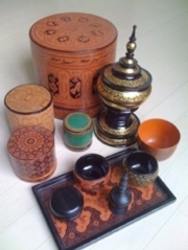 At these programs, participants exchange information relating to the world of lacquer. We discuss the current situation of lacquer art and education in each nation, learn new techniques at the workshops, and view contemporary lacquer art from around Asia and the world at the exhibitions. The goal of the Project is to increase and intensify communication and exchanges between lacquer communities expanding and strengthening the worldwide network that binds lacquer cultures. Lacquer arts and crafts is the common cultural heritage of the peoples and nations of East and Southeast Asia and we believe it needs to be recognized as a World Cultural Heritage. ・ Lacquer artists and experts give lectures and the workshops to introduce Japanese lacquer art and education. ・ Qualified young teachers from the lacquer center in SE Asia are invited to Japan to study lacquer art education, the lacquer crafts industry, lacquer conservation, and other techniques. We offer advice on design and attempt to stimulate interest in new directions for Myanmar (Asian) lacquer art. The current situation of lacquerware production in SE Asia. 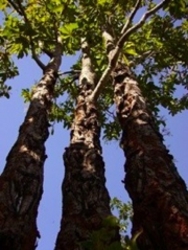 Materials – lacquer refining and processing, base materials, (bamboo, wood, pigments, additives, etc.). Techniques – base shaping, (e.g. bamboo and horse hair), coating, ornamentation, etc. Research into history of SE Asian lacquer art, its origins, development, relationship with and influence on lacquer art in SE Asia, China and Japan. Practice and proposition of lacquer art work with lacquer art artist and technician of each countries. Since 2002, we have researched lacquer in Myanmar, Thailand, Laos, Vietnam, and Bhutan. Since 2004 we have conduct workshops and lectures nine times at the Bagan Lacquerware Technology College. These workshops and lectures focused on the current state of lacquer in Japan and other Asian countries as well as introducing techniques such as “kinma”, “chinkin” and “kawarinuri”. We began a lacquer design project and held lectures focusing on the chemistry of lacquer. 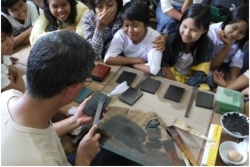 Between 2006 and 2009, we invited three young teachers from Myanmar to Japan to study lacquer art education, the lacquer crafts industry, lacquer conservation, and other techniques. In addition, in 2011 we started exchange program at Luang Prabang Art School in Laos. There used to be traditional lacquer crafts in Laos. but it had almost disappeared except for a young teacher in the Art School studied in Bagan Lacquerware Technology College. 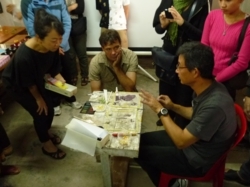 We have conducted workshops and lectures in the Art School, and where students have shown great interest in lacquer art.